More intensive shrimp farming can yield better environmental and economic results, according to a new study conducted by WWF in Vietnam and Thailand. By producing more shrimp per hectare of land, farmers can increase production to meet growing demand for shrimp without increasing pressure on the region’s natural resources. The study in Vietnam and Thailand showed that, in most cases, intensive operations used land much more efficiently, yielding at least eight additional tons of shrimp on each hectare of land. 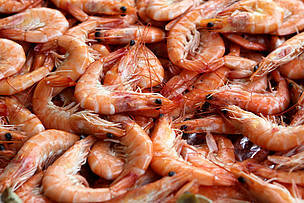 They also reduced the costs of land use by more than 90% per kilogram of shrimp. The most intensive farms made more efficient use of energy as well, with energy costs that were 74% to 89% lower than the least intensive operations. Intensification can also have negative implications as well such as more concentrated wastes in effluent and the potential to stress shrimp to the point that disease outbreaks occur. Farmers use feed to produce about 3.6 million tons of shrimp each year. If they all could improve feed efficiency by a factor of 0.1, it would save 106,000 hectares of land, 37 billion gallons of water, 468,000 tons of wild fish, and 3.6 million gigajoules of energy—enough to power nearly 140,000 American homes for a year. Moreover, the greater efficiency would equate to farm-level savings of up to $110 million in Thailand and Vietnam. Though all natural resources are important, the land used in shrimp farming is primarily located in the coastal zone with high biodiversity, and making more efficient use of land may have the most significant and far-reaching environmental consequences. Leaving habitat intact yields several benefits. First, it mitigates the impact of climate change, which is driven by the loss of forests, mangroves, and other carbon-rich ecosystems. Second, protecting coastal zones provides breeding and nursing grounds for wild fish and other aquatic life. Third, intact habitat—particularly coastal ecosystems such as mangroves—protects in-land communities from storm surges.